This cool space wallpaper reveals, an image combining orbital imagery with 3-D modeling shows flows that appear in spring and summer on a slope inside Mars' Newton crater. Sequences of observations recording the seasonal changes at this site and a few others with similar flows might be evidence of salty liquid water active on Mars today. Evidence for that possible interpretation is presented in a report by McEwen et al. in the Aug. 5, 2011, edition of Science. 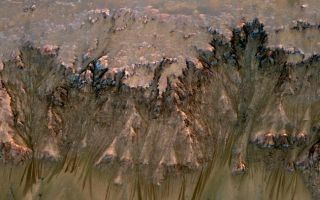 This image has been reprojected to show a view of a slope as it would be seen from a helicopter inside the crater, with a synthetic Mars-like sky. The source observation was made May 30, 2011, by the High Resolution Imaging Science Experiment (HiRISE) camera on NASA's Mars Reconnaissance Orbiter. Color has been enhanced. The season was summer at the location, 41.6 degrees south latitude, 202.3 degrees east longitude.